One of the most obvious differences between paragliding and hang gliding is the glider’s shape. 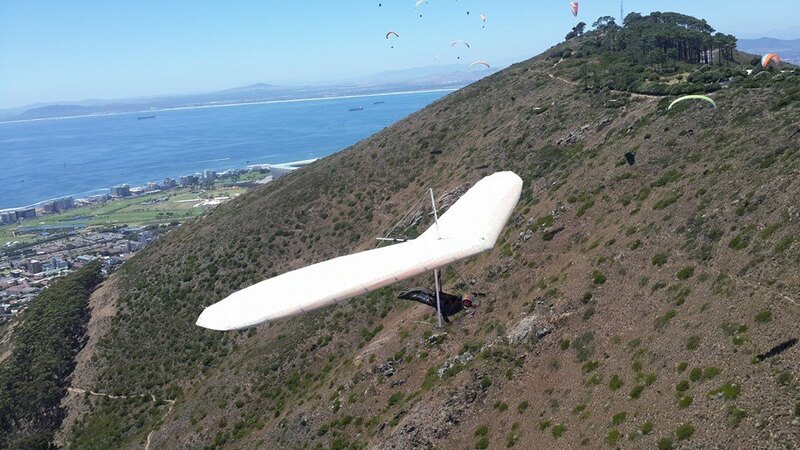 Whereas hang-gliders are rigid structures, consisting of sailcloth stretched over a metal frame, a paraglider consists simply of a paragliding harness suspended underneath a fabric wing. Both rely on seeking out updrafts of air to prolong the flight, but their differing forms do mean that pilots need to take alternate approaches to actually operating the craft, as well see. Both paragliding and hang-gliding are more relaxed than you might think, and require very little in terms of pilot strength, flexibility, and just activity in general. That said, controlling a paraglider manages to be even easier than wrangling a hang-glider. Paragliding pilots change direction and pitch by pulling (relatively gently) on the cords connecting you to the canopy, changing the wing shape and therefore how the wind interacts with it. While this might sound a bit intimidating, its simpler than it sounds  and knowing how the glider will react to your input eventually becomes second nature. In hang-gliding, by contrast, pilots have their body strapped into the craft, and change direction by shifting body weight. This is fairly low-demand activity, but on extended flights it can become a bit tiring for those without good core strength. Wind speed plays a role in determining gliding speed, but while both types of glider have a similar minimum speed (around 25km/h or 15mph), hang-gliders tend to have a higher maximum speed. This isn’t necessarily a good or bad thing  it just means that hang-gliding and paragliding provide a different experience for participants. Those looking for high-speed thrills may gravitate more towards the former, while the latter means hammock-like relaxation from the comfort of the gentle blue skies. Paragliders and hang-gliders each stay airborne with the assistance of thermal updrafts, and as such flight time in both cases is highly dependent on local weather conditions, topography, and pilot skill/intentions as he or she steers the craft. Both gliders can remain in the air for comparable amounts of time, which can range from as little as ~10 minutes to as much as an hour  or even more. At Fly Cape Town Paragliding, our tandem paragliding flights (to give a reference point) tend to range from 10-30 minutes depending on the weather conditions on the day.